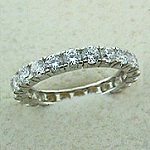 Stock #5206:14k White Gold CZ Anniversary Rings, Eternity Style (stones go all the way around the band)... 1.75 Carat, Gorgeous, Top Quality, Russian Cubic Zirconia!!! Classic and timeless traditional style anniversary ring! Also available in 14k Gold.